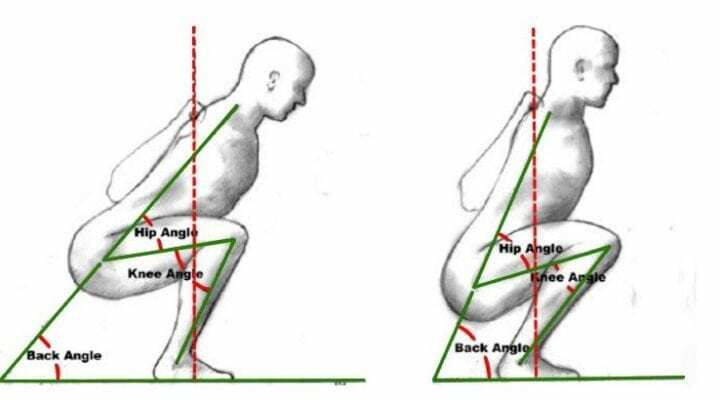 Sprinting vs Long Distance Running: Strength Coach Reveals Truth! Home » Build Muscle » Sprinting vs Long Distance Running: Which is Better For Muscle Gains and Health? Should I do long distance cardio or short? 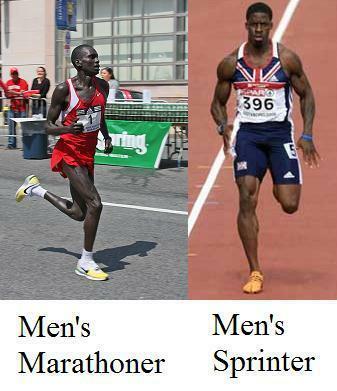 Would you rather look like a marathoner or a sprinter? Well the answer is obvious to me. I would prefer to NOT look like an anorexic woman. And if I could look like that jacked, super lean dude, I’d be thrilled! So how did each of them get to looking that way? Long distance/duration cardio will actually decrease your muscle tissue. When you do a long distance cardiovascular activity you reach a point around 45-60 minutes in where your muscles no longer have glycogen (think of this as stored muscle food). When this happens, your body goes into what is called gluconeogenesis. Gluconeogenesis is a process where your liver converts non-glucose based items into usable energy for your body…. That is as horrendous as it sounds! So when you do long distance cardio you actually will decrease your lean muscle tissue mass. When you do sprinting or high intensity interval training (HIIT) as your cardiovascular activity you actually stimulate muscle growth (1). I don’t know about you, but that sounds much more favorable to me. In doing short duration, high intensity cardio like sprinting or HIIT you stimulate fast twitch muscle fibers and those guys are the ones that hypertrophy….or grow BIG. Research clearly shows sprinting will cause muscles to get bigger (2) And it won’t take much time! Another awesome thing to get you sprinting as fast as you can….. Sprinting & HIIT will increase your power output (3)! And more power equals more speed! Did you know long cardio sessions will decrease your testosterone levels (4)? Did you know sprinting or high intensity cardio will increase your testosterone levels (5)? When your body is busy breaking down all that lean muscle tissue for gluconeogenesis, as mentioned above, your storage of fat goes up. More fat = more estrogen! Adipocytes AKA fat cells are a source of estrogen production in our bodies (6). So, the more fat you have the more estrogen you will produce. Additionally, when lean muscle tissue decreases, so does your bodies drive to produce testosterone. So, levels drop. But what about when you do sprint work or high intensity cardio training? As I stated above, sprinting & HIIT will increase testosterone. When you push your body to grow new muscle, as we talked about in the previous section, you must produce more testosterone to support that muscle growth (7). Obviously, if you’re a distance athlete and your lean muscle mass is going down while your fat storage goes up; than clearly, your body fat percentage and your metabolism will be changing for the worse. If your sprinting and or doing high intensity cardio of another kind, your lean muscle mass will be going up, your body fat percent will be going down and your resting metabolism will be skyrocketing! Sprinting will spike your metabolism so hard that you will see lasting effects from your workouts for up to 14 hours after you finish (8). 14 HOURS of increased metabolism!!! Whereas with long slow distance training the elevated metabolism drops within a few hours. AND while it is true that you burn a higher percentage of fat DURING distance training, the overall actual fat calories burnt is FAR exceeded by sprinting when you factor in the post exercise metabolic burn. So, this guy is telling me distance training will make me fat? It will make you “skinny fat”. In other words, you will be thin with a high body fat percentage. Oh yeah, we covered that…. Never hurts to reinforce physiology! After long distance running is over your body continues to break down muscle for energy (9). Now, don’t get me wrong, this can happen after sprinting too. But only if you don’t feed your body high quality proteins and a simple carbs shortly after the workout. However, that’s basic stuff, I’m sure your already doing….Right?? Just like testosterone, growth hormone is stimulated by sprinting or HIIT (10). Growth hormone is stunted by long duration cardio sessions. You’re going to need more growth hormone for that. Want to recover faster post-workout? You’ll need more growth hormone for that too. Want your organs to function better? The list goes on and on for positive health effects of stimulating your growth hormone. Equally, the list goes on and on of negative health effects when growth hormone is decreased. Of course, cardiovascular activity is great for your heart & overall health. And we think of jogging as the ultimate in cardiovascular health. Sprinting is actually better for your heart & body than long duration cardio. Both long distance running and sprinting have very positive health effects for your cardiovascular system. The difference is that when you do sprints, you get very similar benefits in about 15% of the time (11). So that means you are putting 85% less strain on your body to achieve the same or better health outcomes. Also, consider the wear and tear on your body when doing long distance cardio. With all that extra time spent your body is under constant strain and risk for overtraining and repetitive use injuries goes up with extended length workouts. Your heart and joints will all thank you for choosing sprints. Let’s talk about stress and get nerdy for a minute. You have an autonomic nervous system that controls literally everything your body does that you don’t have conscious control over; breathing, heart rate, blood pressure, digestion, muscle growth, brain development, hormone regulation and so much more. There are two part to this autonomic system. The sympathetic side helps us perform well in sport-like activities, avoid potentially harmful situations and helps us deal with life, work & emotional strains. When your sympathetic side kicks in it’s also known as our fight or flight response. Let’s use running from a bear as an example of sympathetic stimulation. Are you concerned about proper muscle development? Concerned about digesting your food, nutrient absorption and distribution? Proper hormone regulation and other body development pathways? You want to get away from that damn bear! As a result, the “rest & digest” or parasympathetic functions are down regulated, so the body can focus on getting out of the threatening situation. This sympathetic response can get stuck on “high” from various life stressors and when that happens our bodies can’t access the healing properties of our parasympathetic nervous system. All that to say……being stressed long term is a bad thing. We all know exercise will reduce stress. Both long and short duration exercise will reduce stress. Long duration exercise keeps you in that fight or flight, sympathetic, zone for longer periods of time. Hence all the negative outcomes mentioned above in this article. Short duration exercise also stimulates the stress response, but not usually long enough to do damage to the body. And short stimulation of the sympathetic system can have very positive health effects. Ironically, my mom is a chronic marathoner. She has done over 70 marathons including 47 of the States in the United States (soon to be all 50) and she is working on all 7 continents and more. People like her run because they love running. And that’s a damn good reason! I have tons of respect for distance runners and have ran marathons myself. It just simply isn’t the best way to train, especially if your trying to gain muscle. Overall sprinting is more efficient and gets you where you want to be. Don’t be dumb, do sprints. 2. Estes RR, Malinowski A, Piacentini M, et al. The Effect of High Intensity Interval Run Training on Cross-sectional Area of the Vastus Lateralis in Untrained College Students. Int J Exerc Sci. 2017;10(1):137-145. Published 2017 Jan 1. 3. Thepower output and sprinting performance of young swimmers. Barbosa TM, Morais JE, Marques MC, Costa MJ, Marinho DA. 4. Kuoppasalmi, K., et al. “Plasma Cortisol, Androstenedione, Testosterone and Luteinizing Hormone in Running Exercise of Different Intensities.”Scandinavian Journal of Clinical and Laboratory Investigation, vol. 40, no. 5, 1980, pp. 403–409., doi:10.3109/00365518009101862. 5. Tanner, A., et al. “Salivary Steroid Hormone Response in Trained Men to Running and Circuit Training Sessions.”British Journal of Sports Medicine, vol. 45, no. 15, 2011, doi:10.1136/bjsports-2011-090606.19. J Am Acad Dermatol. 2001 Sep;45(3 Suppl):S116-24. Review. 7. Effect oftestosterone on muscle mass and muscle protein synthesis. Griggs RC, Kingston W, Jozefowicz RF, Herr BE, Forbes G, Halliday D.
J Appl Physiol (1985). 1989 Jan;66(1):498-503. 8. Effect of exercise intensity, duration and mode on post-exercise oxygen consumption. 9. Endurance training increases gluconeogenesis during rest and exercise in men. Bergman BC, Horning MA, Casazza GA, Wolfel EE, Butterfield GE, Brooks GA.
Am J Physiol Endocrinol Metab. 2000 Feb;278(2):E244-51. 10. Brief, high intensity exercise alters serum ghrelin andgrowth hormone concentrations but not IGF-I, IGF-II or IGF-I bioactivity. Stokes KA, Sykes D, Gilbert KL, Chen JW, Frystyk J. 11. The effects of a novel high intensity exercise intervention on established markers of cardiovascular disease and health in Scottish adolescent youth. Buchan DS, Young JD, Simpson AD, Thomas NE, Cooper SM, Baker JS. J Public Health Res. 2012 May 25;1(2):155-7. doi: 10.4081/jphr.2012.e24. eCollection 2012 Jun 15.